In medicine, some conditions can be diagnosed clinically. With a physical examination and a laboratory test, a diagnosis can be made with certainty. Other conditions aren’t so simple. Doctors use a differential diagnosis to eliminate some possibilities until they narrow down a probable diagnosis. They may not be able to guarantee 100% accuracy of a diagnosis, but they can narrow down the probable options in order to develop a plan of treatment. Relationships are so complex that we assume they cannot be clinically diagnosed. They ebb and flow so continually that it’s hard to know if a specific relationship is healthy or not. 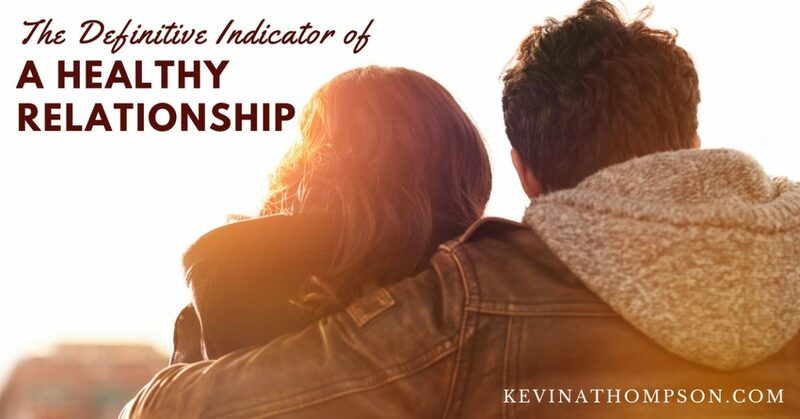 Yet there is one definitive indicator which we can use in order to diagnose the health of any relationship. This indicator equally works for every relationship–husband/wife, parent/child, employee/employer, co-workers, friends, etc. Proximity. While we tend to avoid people we don’t like, sometimes we don’t have that option. Probably every person has someone they are physically close to on a regular basis which they do not like. While proximity is important, it’s not a definitive indicator. Kindness. Genuine kindness is essential to a healthy relationship, but we can be kind to people we do not like. We can be gracious even when we’ve been wronged. And we can fake kindness in order to give the appearance that all is well. Time. Spending time with someone is essential to having a healthy relationship. When two people lessen their quality time together, it’s often a sign of relational strain. However, by itself, time does not define the health of a relationship. To the extent that two people truly listen to one another, their relationship is healthy. It’s not perfect. There are frustrations and misunderstandings. But it’s healthy. When two people listen to one another–truly listening in order to understand–they can navigate everything. Differences can be discussed. Opinions shared. Frustrations expressed. Whatever may hinder the relationship can be confronted or dealt with, and a settlement can be negotiated. This allows both parties to feel heard, respected, and understood. It empowers them to know they can influence one another and the relationship. A healthy relationship is characterized by listening. Correlation. Listening is always related. Healthy relationships are defined by good listening. Broken relationships are characterized by lack of listening. Causation. In some scenarios, the relationships suffer and it results in a decrease of listening. But in many situations, listening erodes which decays the relationship. It’s this second scenario where we must pay attention. Some people make poor choices which justify us not respecting them and not listening to them. However, in most broken relationships, the unseen cause is a failure to listen. As two people unintentionally spend less time together and fail to do the work necessary to truly hear and understand one another, the relationship suffers. As it does, they listen even less. What is created is a cycle of unhealthy behaviors which further drives individuals apart. We can do several things to make sure we listen to one another. 1. Make the decision to listen. Listening is an activity. It’s the result of a choice. We either choose to listen or we choose to ignore. In part, this is what makes listening so impactful in relationships. When I fail to listen to Jenny, I have chosen to give something else my attention over her. If you want to listen, choose to do so. 2. Push aside assumptions. The greatest hindrance to truly listening is assuming we already know what the other person will say. These assumptions cause us to ignore the words of another and focus on how we might respond. Listening doesn’t require a response. Rather than focusing on what we want to say, work to understand what is being said to us. 3. Do the work. Listening is hard work. It takes energy and effort to hear what someone is saying, to try and understand the meaning of the words they have chosen, to read body language, to identify the context in which things are being said, to report what we are hearing, to ask relevant questions, and to be willing to allow the words of another to influence us. It’s much easier to make assumptions rather than to actually listen. If listening is the ultimate litmus test of relationship health, how are your relationships? Consider your interactions with your spouse, children, parents, employers, employees, friends, and others. Are you influenced by their words? Are you making an effort to truly hear what they are saying? Do you regularly realize you were misunderstanding the words of another? Do you have a set time period where you will talk with important people with no distractions (phones, computers, other people, etc.)? Are you quick to forgive when they misspeak or you misunderstand? Do you regularly learn more about others when they talk? What did you mean when you said _____? Were you trying to say ______? Each of these statements shows an attempt to understand what a person is saying. You said _____, but what you really meant was _____. In both of these cases, you aren’t trying to understand the other, but instead, you are attempting to tell the other person what they said. Healthy relationships are defined by good listening. Some other worst words: You never _____; or You always _____.